Our experts design marketing campaigns and collateral that get in front of your prospects for a fraction of what it would cost to staff in-house part or full-time support. We generate traffic to your web site through various marketing efforts focused on gaining exposure for your brand and your products and/or services. We provide what you need…when you need it – creatively, affordably and effectively. Our outsourced marketing support is for businesses of all sizes and from all industries…short or long term. Each outsourced marketing bundle is custom designed to fit your designated budget, needs and goals. While you choose what you want us to do, we’ll guide you through the process and recommend options and best-practices for your consideration. We deliver affordable and effective marketing solutions to businesses of all sizes and from all industries. Contact us to request a quote today. Digital marketing is an umbrella term for the targeted, measurable, and interactive marketing of products or services using digital technologies to reach and convert leads into customers and retain them.The key objective is to promote brands, build preference, engage with customers and increase sales through various digital marketing techniques. It is embodied by an extensive selection of service, product and brand marketing tactics, which mainly use the Internet as a core promotional medium, in addition to mobile and traditional TV and radio..
Across all industries, the average CTR* for a paid search ad is 1.91%, and 0.35% for a display ad. 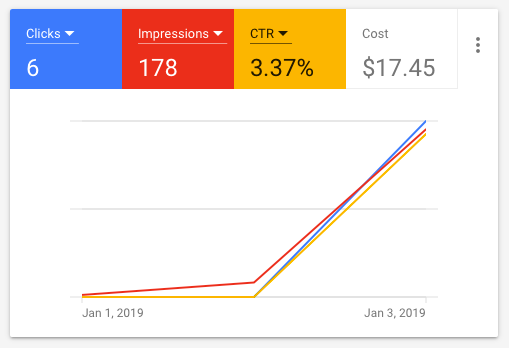 Check out our stats after just a couple of days for a Google search ad campaign we're running for a client in a highly competitive industry - where CTR is typically lower than average. ——- *Click-through-rate. A clickthrough rate is how often your paid ad is viewed AND click on. A high CTR indicates high quality ad content, keywords and positioning.